This Tungsten Ring comes in a 6mm and also an 8mm band. 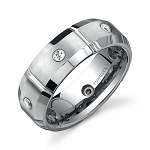 The tungsten ring has 7 CZ Stones for a great unique look. The stones are flush with the surface of the ring. This tungsten ring is comfort fit contoured on the inner surface for a more comfortable fit. Completely hypoallergenic, out tungsten carbide rings will never turn your finger green or cause irritation to your skin. If you need a durable yet elegant ring, this is for you! Included 100% Money Back Guarantee! Also comes with a black velvet stylish ring box and FREE SHIPPING! Q: Is it real Diamonds ? A: These are not real diamonds, these are Cubic Zirconia stones. Was this answer helpful? 45 of 47 Customer(s) found this Answer helpful. Q: Not sure of the size of ring I need. If the ring is too large or small can I exchange or return it, as long as I did not request to have ring engraved? Was this answer helpful? 24 of 25 Customer(s) found this Answer helpful. Q: Can I get this ring in gold plating? Can any of your rings that are not gold plated be ordered in a gold plated option? Q: what size are the c-z? The size of each CZ is about 1.5mm square. Hope this helps! Q: Is this a Man's ring? A: This can be for a guy or a girl. We have many men who purchase this ring and are very happy - Many women also! Q: are the stones cz or diamond? can this ring be ordered in 4mm for both men and women or just in 6mm? A: Hi Elvis, These are CZ stones and this ring comes in the 6mm and 8mm shown only only at this time. Q: If the ring does not fit can we exchange it for the correct size? Q: Can I ship the ring back for engraving once I'm sure it's the style and size that I want? How much is the return shipping? Q: Does this ring fade or change colors (dull-gray) after wearing it in your everyday activities? I love this ring! It's very comfortable and sparkles without being gaudy. Initially I ordered the wrong size; exchange was easy. It fits perfectly. Thanks for the great product! Item arrived quickly, was packaged very well, and certainly looks great!! Price was exceptional, and I will certainly buy from this company again. When I first placed the order I inadvertently entered an incorrect email address. I emailed support, and after 10 minutes and 3 or 4 email exchanges, they had it fixed for me. Awesome product, and awesome support. We love our new tungsten rings, I had entered the wrong size on my order, I called, it was corrected and I had them within 3 days! I wanted matching rings for me and my husband and as stated above, they are perfect. Will recommend to others and probably buy again! I got thus ring for my fiancee it looks great. Has a good weight to it, which i like. I would reccomend. I will have to exchange the size my fiancee's ring size was smaller than she thought. My wife and I celebrated our 18th anniversary yesterday with friends nd both of the other men's wives commented on how much they liked our matching rings. We love them, they do not tarnish or scratch at all. Wonderful product. Ours were stolen when we hired movers last October and these are our wonderful replacements. We are extremely pleased with the fast service and terrific product! I always loved the look of these rings and bought one for my husband, but I could not find one in a smaller size to fit myself. I was thrilled to find your website with such a great selection. I ordered one with CZ's in it and was even more thrilled when I received mine! I admit I was skeptical with such low cost. I don't think that you could improve on the quality or the service for any price! I do plan on buying more! Absolutely beautiful ring with a perfect fit. Don't try to buy these off of eBAY, you won't be happy.... My wife LOVED hers ! This ring is durable and elegant. It is best suited for someone who's always out working with their hands. It would not be a distraction and definitely will not cause you to be a target. Wear it comfortably with no worries of damaging something so expensive. Very nice ring for the price. Wish there was an option to have diamonds and/or different stones. very nice finish on the tungsten band. smooth. not sure how this holds up long term but certainly nice now. very satisfied. It looks exactly as the picture and fits to a T. Will be wearing it as my wedding band. We bought this ring so I could wear it around the house, it fits nicely but it is kind of masculine looking. I would prefer a thinner band. Very nice ring and my other half just loves it! Fit's perfect and would buy another ring in the future. Love this ring, I wear it in place of a very expensive wedding set when there are concerns about safety. Don't hesitate to purchase this is simple but great look also. This is also our second purchase of a ring from this company, I purchased my husband a camouflage wedding band because it states that they will not scratch or bend, and they don't. This is his third ring and the only one that is still looking great, marines are had on rings. The ring is fantastic. I (husband) may steal it from her. She thinks 6MM looks more like a man's ring. We might add two 2mm rings on either side of this one. I am so intrigued by the use of this metal that I am shopping your site for myself. This ring is even nicer than I thought. The shipping is super fast and FREE! The customer service is excellent. Exchanges are very quick. I will definitely recommend Tungsten Fashions to my friends and family members.